It only takes a moment to make progress with my new project, which is lucky for me because that's all I have this morning, heh. I got the idea to do this as I've been overhauling my house all summer, shedding all the clutter and unnecessary things, clearing away the distractions to get at what matters both quickly and easily. And as I worked through the boxes and cupboards and shelves, it struck me: how great an approach to life is that? So I've decided among other things to stop and smell the flowers mindfully, one way or another, at least once a day. As I can, I'll capture the happiness with my camera - that way I can enjoy the same moment later in the day too. And of course, I'll share any photographs with you here at Hugs. My first is that Welcome sign, from the cottage. 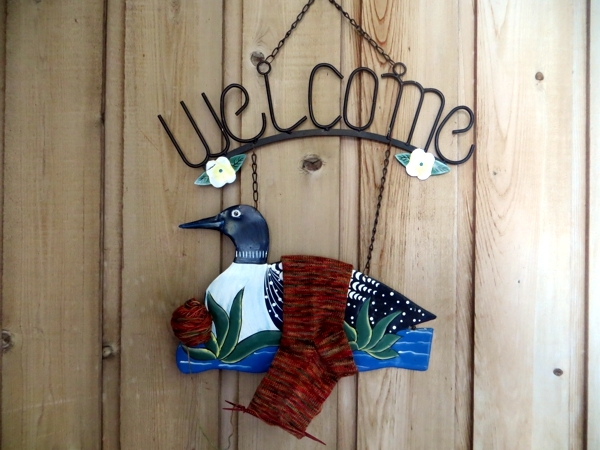 I don't know who gave it to my aunt and uncle, but they chose to hang it on the outside so that you see it every time you come up the stairs to the deck from the lake. In the winter, it comes inside to wait for another season to welcome all who pass through. It's such a small thing to be so big. I hope something makes you happy today (and all weekend too) till I see you again Monday. And if it's knitting, so much the better!